Supervisor Mark Ridley-Thomas speaks at this morning’s event. At right is Duarte Councilman and Metro Board Member John Fasana, who served as M.C. for the event. From left that’s Metro CEO Art Leahy, Assemblyman Ed Chau, Assemblyman Roger Hernandez and Rep. Judy Chu. Also present for the event but not in this photo were L.A. Mayor Antonio Villaraigosa and Rep. Grace Napolitano. Photo: Steve Hymon/Metro. A look at the soon-to-be ExpressLanes on the eastbound 10 freeway. Photo by Anna Chen/Metro. With clear skies above and a sound weather forecast, everything looks like a go for the ExpressLanes on the I-10 to officially begin at 12:01 a.m. tonight. Or to put it another way, if you want to use the lanes after midnight tonight, you need to have a transponder in your vehicle — unless you’re on a motorcycle with a standard California license plate. Many more details about the ExpressLanes can be found on our earlier post. 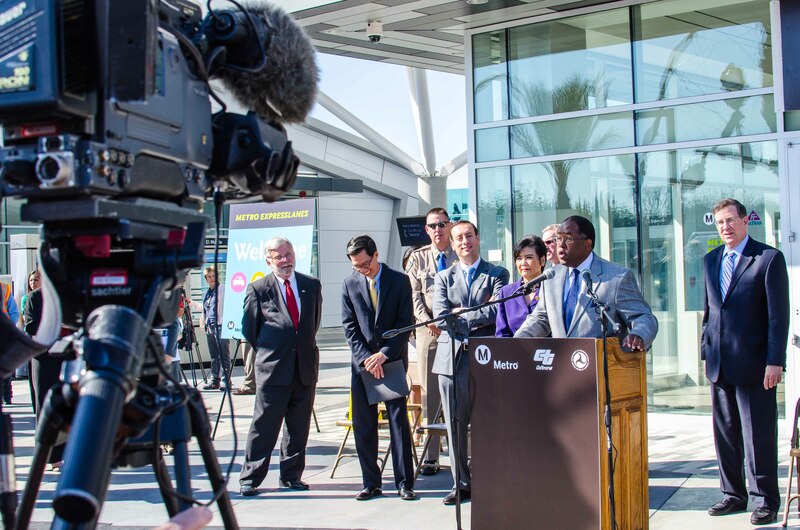 As for the press event today at El Monte Station, the many public officials on hand ran through those details and said repeatedly that they believe the new ExpressLanes will add capacity to the 10 freeway and speed up trips for motorists. 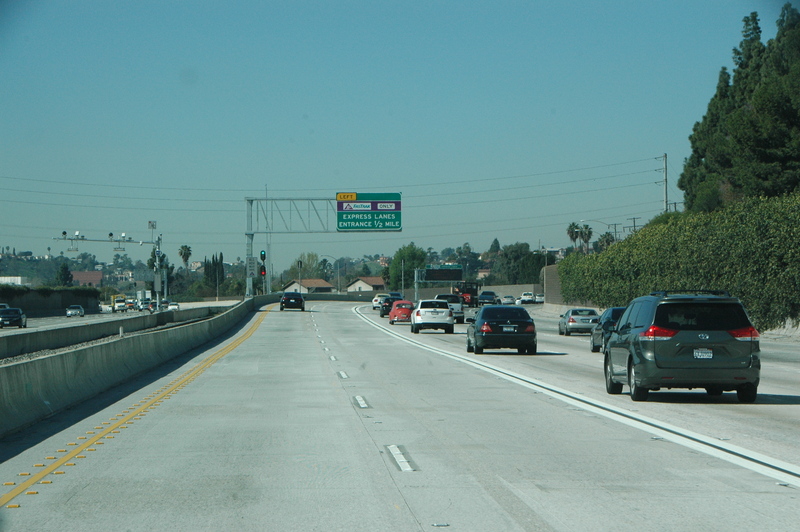 Rep. Judy Chu pointed out the new lanes on the 10 will help carpoolers, transit users, single motorists who are willing to pay a toll and even those who would use the general lanes. Obviously, the future is not written in stone and the ExpressLanes are a one-year experiment, largely funded by the federal government. As the year proceeds, Metro officials say they are going to keep tinkering with the program to give the ExpressLanes the best chance to succeed. Great. Now these “former” carpool lanes will also be completely empty on the weekends, as are the 110 lanes currently. Metro seems to not have considered the fact that thousands that might use these corridors once a month or so on weekends, won’t consider forking out the dough upfront for the transponders. These lanes are EMPTY, EMPTY, EMPTY on the weekend, while the “free lanes” are backed up. Go look, it doesn’t take a year of study to see it. By the way. I recall the early to mid 90’s the pain we had to endure in lost time, spent taxes, inconvenience of having the Harbor Freeway rebuilt. Now, Metro has taken those lanes away from me as a taxpayer. I want compensation for that theft!